This Triang No.50 is in much need of restoration. The front opening metal door has been papered with a brick paterned wallpapered, the roof is a replacement, which has also been papered over. The roof needs replacing as the card roof has been replaced with plywood. I am not sure if the hinges are original, but the wood has split and needs repairing. I have started to remove the brick paper and paint from the metal front, I think it has been treated with a green paint for rust. There is not a lot of the original paint remaining. When I removed the paint I found that on the remaining original paintwork there was painted flowers, which I was surprised to find. I thought that these houses were either plain or decorated with flower decals. I should be able to copy these when I repaint the front. 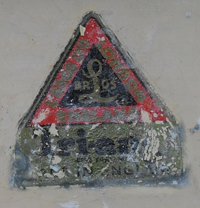 The Tri-ang label had been painted over with two coats of paint. Using a cotton bud and paint stripper, I carefully removed the paint. Although not a perfect job, I thought it was not too bad as it was covered with so much paint. 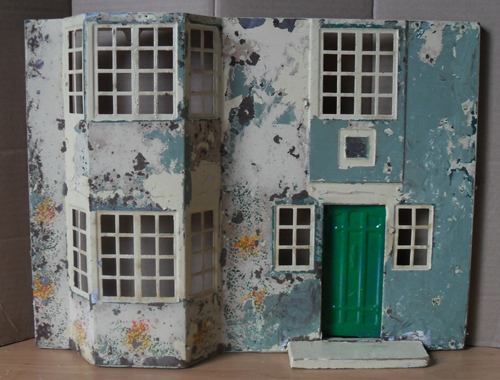 I have finished preparing my No.50 Dollshouse ready for painting. 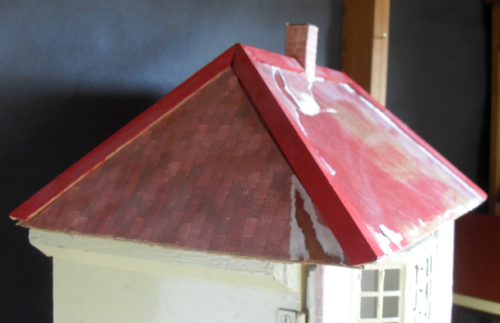 It has taken such a long time, as there was so much surface rust which had to be treated, and a lot of paint to remove. I managed to remove the door by taking out the pins on the hinges, I will replace them with small nails. 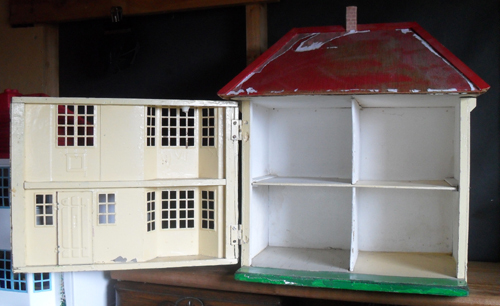 All the paint has been removed and will be repainted its original colour. The front panel has now been repainted. 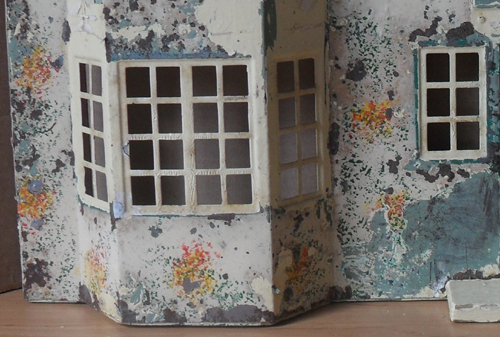 When I stripped off the paint I noticed flowers painted on, I have not seen them on other houses of this style before, so I thought I would reproduce them. All that is needed is the front door.